I've talked a lot lately about the role of being a wife. It's a role that most people take lightly, and honestly, most people will probably just skim over this, but the task is so much more than we realize. It's a role that comes with a lot of privileges but also a lot of responsibility. Even if you're reading this and aren't married, engaged, or even dating someone, this still applies to you. So keep reading, friends, please. As I was growing up, my parents prayed for my future spouse. I can remember days of despair after a breakup and my dad hugging me and reminding me that he's still out there, because he's been praying for that man since the day I was born. I thought it was sweet and sentimental, but never really thought too hard about it. We're fairly new at this whole marriage thing. It's a lot tougher than I expected, but a lot more wonderful, too. This world is hard and there is so much negativity that surrounds all of us, and I don't have control over many things, but I do have control over this. I'm able to pray for him. I listen to friends struggle with relationships or marriages and secretly think to myself how grateful I am that we do have it easy most of the time, but I also know that hard times will come, so the least I can do now is pray. Pray with all my heart. I want to be all things for Andrew. I want to be his comfort and his support. I want to encourage him and uplift him when he's struggling or has had a hard day. I want to help him be successful with work and in other relationships. I can try to do that and succeed to some extent, but I'll never be enough. As much as I want to, I just can't. I'm not able. I've learned over the past few months to not just pray for circumstances going on around my husband, but also pray certain verses over him. He is the head of our household and the leader of our family and I so desperately want him to be equipped with the Holy Spirit and covered in prayer on a day to day basis. This world is too cruel not to do that for him. ...so that's where I am. That's what I'm doing. Praying over him and our marriage. I pray for his leadership skills, for him to have courage in situations and not be afraid to stand up and be a leader. This translates into our marriage, into his work life, into our discipline with future children. I pray that he possesses skills that a leader needs to be respected and successful. I pray for the influence from the people around him. I pray that the friends he chooses and that the people he surrounds himself with are people who encourage him, lift him up, and help with him with his walk with the Lord. I pray for the influence that he is on the people around him. I pray that he encourages those around him and shows patience, compassion, and kindness with coworkers or others he comes in contact with throughout the day. I pray that others see Christ through him. I pray that he seeks the Lord every day. I pray that he has the desire to know the Lord better and make Him known. I pray that he wants to grow in Christ. I pray over his mind, his body, his spirit. I pray that he resists temptations and treats his body as a temple. I pray that Satan's attacks are in vain and that he can stand strong in the face of adversity. I pray that he seeks the Lord's will for our family, for our marriage, for his career. I pray that he is obedient to God's call and desires to follow His commands. I pray that he always puts God at the top of his priorities, and me second. Praying over Andrew is one of the biggest gifts I can give to him and to our marriage, and for now, that's what I'm going to keep doing. There are days when I'm too occupied with myself and my own happenings, and the Lord is quick to remind me that I'm not spending enough time in prayer. I'm nowhere near perfect, but I do have a God who is, and I pray that He pours out his blessings over this new marriage, today and for years to come. Do you pray over your husband or boyfriend? Single friends, are you praying for the man you're going to marry? Do you think it's important for your relationship or do you feel like it's just going through the motions? I'm eager to hear your thoughts on this topic! This is huge girl, and SO important. Sharing! 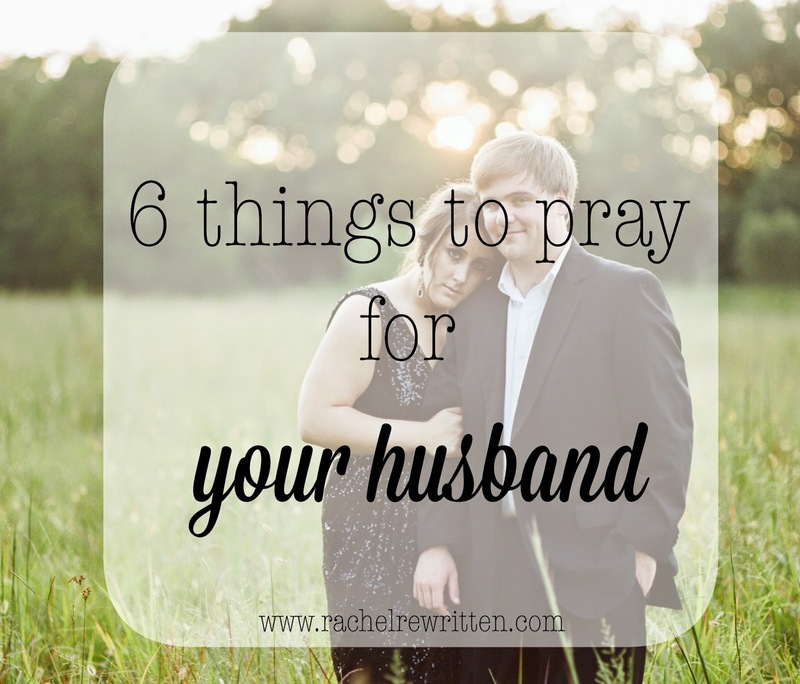 We can be such prayer warriors for our husbands. And they have to deal with us, so we know they need it! haha! It never occurred to me to pray for my spouse beforehand but I have a friend who does. She also keeps a journal to give him. I love the idea. I believe that the designation "wife" does come with a lot more challenges and responsibility than most realize or embrace. Bravo! I think this is really needed in relationships today. Although, I'm not married, I can certainly pray these prayers over my boyfriend soon to be husband. Thanks Rachel! I have been thinking about this so much lately. I have been praying more for my husband but you pointed out some areas I want to pray more deeply about. I have spent too long being a "wife" in the sense too many people take it and felt more like a roommate for a while. I'm working more toward being a Godly wife and I can already tell a difference in our relationship. This is awesome, Rachel! So good! I'm going to come back to this often and pray the same for my husband. I prayed through "A Wife's Prayer" and it was such a blessing. Prayer is huge! I am single and I do talk about the future mister but I don't always know what to pray for. Thanks for this. Thank you for posting this. As a single girl it's something I need to focus on more to prepare myself for marriage and pray for my future husband. I think I pray but not in the way I should be, it should be more intentional I think. If that makes any sense. Would love to chat about it sometime, if you'd be willing? Yes mam, I'm praying for that lucky dude out there! (JK) I feel that it is VERY important to pray for him and FOR him to come into our lives at just the right time! God has a beautiful plan for everything! I am sorry to say that I don't pray as often as I should. Well, it is more often that I find myself in a situation where he needs me and because I want to offer the best advice or comfort I know, I then pray that God give me the words. I married a good man, but that is one thing we struggle with- worshipping together. We kept our faith personal and somewhat private while dating. Now 8 months into marriage, we are steadily working on opening up and worshipping together. My dear, this is HUGE and you are a step ahead of the game to have this realization this early in your marriage. Life can and usually does throw such tough times at us and the more prayed up we are the stronger we will be to face those times. A profound post!!! I love this! You are very wise to be realizing this now and so early in your marriage. My husband and I pray for each other daily and it serves as a constant reminder of our value to each other. Thank you so much for posting this Rachel! I love this so much! I love how specific you are in your prayers for your husband. It is something that I have been trying to get better at doing! I pray for him all the time, but I love the idea of having specific verses. Thanks again for sharing!